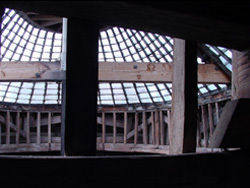 As part of our appointments as Metalwork Advisor to the National Trust, and Architectural Metalwork Consultant to English Heritage, we are regularly called upon to visit properties and advise on potential ways forward with regard to the conservation of metalwork. This advice can range from providing technical or practical solutions to problems with specific objects or architectural detail, to general advice on the care, display or conservation of whole collections. We act as advisors and consultants to individuals, architectural practices, heritage organisations and galleries. We also advise many clients on the physical security of outdoor sculpture and monuments, and have designed and made individually-tailored security devices for precious objects housed in museum collections. 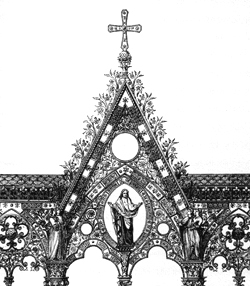 The Hereford Screen was designed by Sir George Gilbert Scott and made by the Skidmore Art Manufacturers Company of Francis Skidmore, based in Coventry, and was displayed at the International Exhibition in London in 1862 (left) before being installed in Hereford Cathedral (below, left). 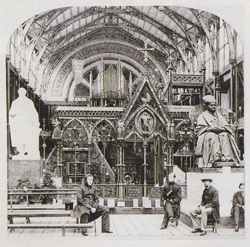 The most ambitious large-scale piece of 19th-century metalwork in Britain, it was described by Pevsner as ‘a High Victorian monument of the first order’. The screen is 36 feet long, 34 feet high and weighs around 16,000 lbs. The framework is cast iron with burnished brass columns. Copper was used for the capitals and foliage designs; the figures of Christ and angels are of electroformed copper. There are also bosses made from marble and crystal, and the whole is covered in paint and mosaic work. 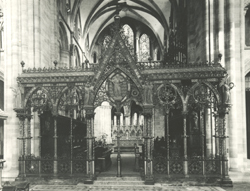 In 1967, amid much controversy, it was removed from Hereford Cathedral on the grounds that it hindered modern liturgical practice. It was dismantled into hundreds of separate elements and boxed into wooden crates, packed with straw and newspapers. First acquired by the Herbert Museum and Art Gallery in Coventry, the screen eventually passed to the V&A in 1983. In 1998 we were asked to examine the screen and produce a detailed specification and budget costing for its full restoration. We produced a 220 page document with detailed condition reports on the metal, wood and mosaic elements, specifications for the restoration of the same, photographs, the results of paint analysis to enable the original colours to be reproduced exactly, and a breakdown of all the budget costings for the completion of the entire restoration and installation in the V&A’s metalwork galleries. The Royal Household asked us to carry out a full inspection of this statue and plinth and provide a full condition report with conservation recommendations. The bronze is signed by Josias Ibach, 1679, though existing research suggests that the sculpture was made after a model by Grinling Gibbons. 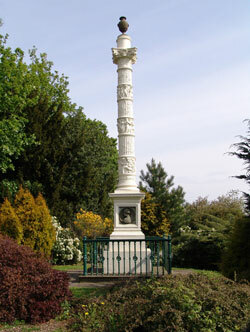 Gibbons also designed the carved marble panels which decorate the pedestal plinth. 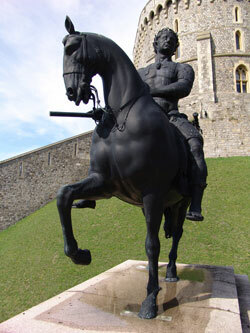 The bronze was commissioned by Tobias Rustat to commemorate both the King's fiftieth birthday and the twentieth anniversary of his Restoration. 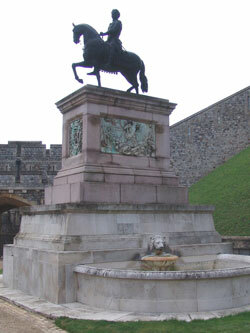 The statue now stands at the foot of the Round Tower in the Upper Ward at Windsor Castle. Weston Park in Sheffield contains many monuments and memorials and has fine ironwork and terracotta work at its entrances. When the park underwent full restoration, we were asked to provide written advice on the appropriate restoration of all the monuments, gates and railings within the park. We were consulted for advice on this large, iron roof lantern at Ickworth, a National Trust property. We made recommendations for conservation of the ironwork and provided specifications for decoration, in liaison with the Architect, Structural Engineer and Glass Conservation Advisor. The De La Warr Pavilion was opened in 1935. Designed by Erich Mendelsohn and Serge Chermayeff, it is one of the earliest Modernist buildings in the UK. Given the sea front position, the façade is intermittently subjected to extreme environmental conditions, which had caused deterioration of the steel windows, resulting in fracturing of the curved glass and degradation of the coloured Terrazzo screed cast in-situ around them. We provided the Client with analysis of the problems and recommendations for correct restoration processes.